Hamburg based URW Type Foundry GmbH was founded in 1996 and specializes in bespoke custom projects and high-quality typefaces. URW Baskerville | Introductory Offer - 50% off until May 13th! 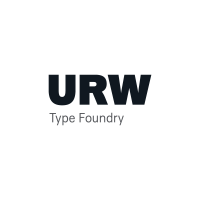 URW Type Foundry GmbH is a German company with a long and rich history in type design and engineering. As the direct successor of digital type pioneer URW GmbH, it continues to design and develop first class typefaces and custom projects. URW Type Foundry GmbH is renowned for a comprehensive library, a specialization in global font technology, and its overall role in type development. URW Imperial | Introductory Offer - 50% off until May 20th! Olivine | Introductory Offer - 50% off until May 14th! URW Impact | Introductory Offer - 50% off until May 6th! URW Grotesk | Introductory Offer - 50% off until Apr 29th!